Noble Park Community Garden is a dynamic project aimed at creating community and improving the sustainability of life in Noble Park for local residents. This project aims to engage people in sustainable lifestyles and also utilise the garden as a catalyst for other projects and local initiatives. The garden is an initiative of Noble Park Community Centre and is strongly supported by the Dandenong City Council and local businesses. Noble Park Rotary, Bunnings Sandown, Dandenong City Council, Derek the local Landscape architect, local shops and Noble Park Primary School all pitched in to lend a hand. 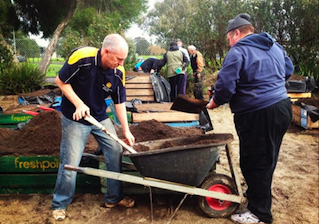 Noble Park Community Centre (NPCC) is a community-based organisation based in the southeastern suburb of Noble Park. The Centre aims to provide opportunities to the local community for education, personal and professional development and social cohesion. The organisation is run on community development principles with community empowerment and self-determination at the heart of all initiatives. With a diverse and eclectic mix of members, the NPCC is a hub for community groups, sporting clubs and cultural associations of all kinds to mix, socialise and run activities for their members. Together with key stakeholders, NPCC and Urban Reforestation have defined a vision for the site that delivers an ideal community garden for the benefit of local residents and visitors alike. Key to the success of this project was the engagement of the local community in the design and delivery of the space as a tool to assist in community building. Noble Park Community Garden provides an opportunity for local residents and organisations to participate in gardening activities, food growing and workshops, and is simply a place for local residents to enjoy.